Facts about Norwegian Forest Cats, "Scientific name for Norwegian Forest Cat is Felis Catus". The "Norwegian Forest Cat" originates from Northern Europe particularly Norway. The Norwegian Forest Cat, which has developed through the nature’s natural selection that’s why it has thick glossy, waterproof, long and well insulated undercoat to withstand severe cold temperatures. At one time, the Norwegian Forest Cats were dying out; fortunately, a special breeding program was introduced in order to save the species. The Norwegian Forest Cats are medium-long-haired breeds commonly known as the farmers working cats. The Norwegian Forest Cat has a long equally-shaped head and medium muzzle strength. The Norwegian Forest Cat is larger than the average cat having almond-shaped eyes, which may be of any color. 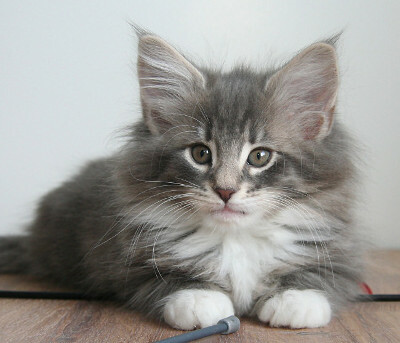 While the Norwegian Forest Cats ears are large and wide at the base, the tail is bushy and the legs are quite long. The Norwegian Forest Cat have very sturdy claws used for climbing structures and holding the prey tightly. Because of the harsh conditions this Norwegian Forest Cat originated, it is double coated. Norwegian Forest Cats glossy and thick coat varies in length depending on seasons. The Norwegian Forest cat is characterized by almost all types of fancy colors except the chocolate, lilac, apricot, amber and the Siamese pattern. This large muscled and elegant semi-long-haired cat matures very slowly and the Norwegian Forest Cat takes up to 4 years for it to reach maturity. The Norwegian Forest Cat is intelligent and loving despite originating from harsh origins. The Norwegian Forest Cat interact will all members of the household and even the guests. The Norwegian Forest Cat like playing with the children as they are energetic and gentle. The Norwegian Forest Cats are daring cats, which defend their territory no matter what, but this doesn’t mean that they are such demanding. The Norwegian Forest Cat are usually affected by kidney and heart complications. The Norwegian Forest Cat can also suffer from certain types of perinatal hypoglycemic collapse plus delayed onset of neuromuscular degeneration in glycogen. Norwegian Forest Cats have very sharp hearing and their sense of smell is fantastic. Norwegian Forest Cats average life span is around 12 to 15 years. The reason why Norwegian Forest Cats can squeeze through very small spaces is that they have no collarbone and free-floating clavicle bones that their shoulders are attach to their forelimbs, that's why a Norwegian Forest Cat can fit through a hole the same size as its head and they use their whiskers to determan if they can fit through the space. Otherwise, the Norwegian Forest Cat are generally healthy hardened cats, which can stay healthy for long years if they are given the correct food and vaccination. Norwegian Forest Cats long hairs should be combed regularly while the teeth, the nails and the eyes should be Norwegian Forest Cat checked occasionally. The Norwegian Forest Cat can eat the recommended cat food without any problem but they will enjoy treats like ham, cheese and chicken. The cows milk makes the cats stomach upset, while plenty of water keeps its body hydrated which is actually healthier. Norwegian Forest Cats on average sleep 13 to 14 hours a day and when they are awake, the spend a lot of time liking themselves to keep themselves clean. Norwegian Forest Cats help control rodents like small rats and mice where the live homes, warehouse, ect. A female Norwegian Forest Cat is called a "queen or molly", male Norwegian Forest Cat is called a "tom" and the name "clowder" is called a group and young or baby cats are called kittens. A Domestic cats have an average weight around 8.7 to 11 pounds (3.9 to 5 kg). Norwegian Forest Cats can see at levels of light six time lower than a human, this is why cats can catch mice so easily at night. Norwegian Forest Cats outer ear uses 32 muscles to control it, and a human has only 6 muscles in its ear and a cat can move its ears 180 degrees. A Norwegian Forest Cat can move their ears independently. The cat's hairball is called a "bezoar" (meaning a concretion or calculus found in the intestines or stomach of certain animals, in particular ruminants, formerly alleged to be an effective cure for poison). A Norwegian Forest Cat can climb up a tree well but can not climb head first down a tree, because all the claws on a cat’s paw points the same direction, to get down from a tree, a Norwegian Forest Cat has to back down. A Norwegian Forest Cat can run at a top speed of about 30 mph (48.2 km) over a short distance. A Norwegian Forest Cat rubs against a person to not only to be affectionate but also to mark out its territory. A Norwegian Forest Cat does not like water because its fur is not insulate it well when it gets wet. A Norwegian Forest Cat averages about 12 whiskers on both side of its face. A Norwegian Forest Cats jaw can not move sideways, there for a cat can not chew large pieces of food. A Norwegian Forest Cats back is highly flexible because of its 53 loosely fitting vertebrae. The body of a Norwegian Forest Cat has 230 bones. While a human body has 206. Compared to a humans who only have 34. The average Norwegian Forest Cat temperature is 101.5 °F (38.6 cel). The Norwegian Forest Cats heart beats at 110 to 140 a minute, That is almost twice as fast as a human heart. A Norwegian Forest Cats has 30 teeth while a kittens has about 26 teeth that they will lose at about 6 months of age. A Norwegian Forest Cat has the ability to jump up to six times its length.